I love coffee shops. The sound of the espresso machine, the grinding of coffee, and the hustle and bustle bring me to a happy place. Sometimes, however, I need to settle in and get some serious work done. I don’t want to fight for table space for my laptop, my textbooks, and my highlighters. I just want a comfy chair, free WiFi and a friendly staff that doesn’t mind if I take up a table near a power outlet for a few hours. Restaurant hopping while studying for grad school has me thinking outside the “Starbucks box”! 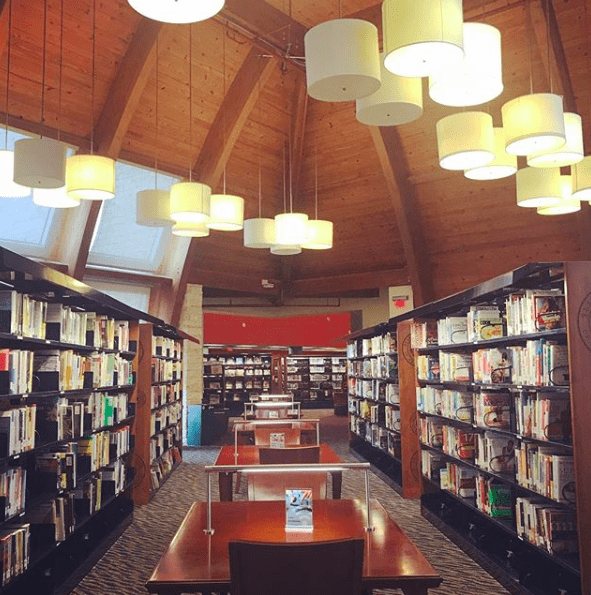 Because these perfect study spots are hard to come by, I was hesitant to put out a list of my go-to places around Frisco! But in an effort to support my fellow on-the-go laptop and textbook carriers, here they are! Frisco, it’s time to start thinking outside of the coffee-shop-box for your remote working hours. This charming spot is hardly a secret in Frisco. Between the WiFi, the ridiculously delicious food and self-serve coffee, it’s no wonder everyone knows about it! You have the choice between the front room by the coffee, the back room (where I hide) or the front patio. You make a great choice no matter where you are and it’s easy to lose track of time in such a welcoming, comfy space. Pros: Indoor and outdoor seating with lots of outlets, Wifi, a friendly staff, and delicious coffee. Cons: Lack of squishy, comfy chairs. Yes, I realize I look odd walking through Stonebriar mall with my textbooks and laptop, but I’m headed to an oasis amongst the chaos, known as Bazille. I usually choose a booth along the wall facing the kitchen, where I stare when I’m deep in thought (aka procrastinating) and munch on brussels sprouts. The tea selection is fabulous and they’ll refill your hot water as much as you like. It’s a quiet setting where you can jump on a conference call if needed. Pros: Accommodating wait staff, delicious food, WiFi, large table space, comfortable seating, free bread, and delicious chocolate delivered with your bill. Cons: Parking at the mall, walking through Nordstrom or the mall with a laptop or textbooks. If you want to feel like you’ve left Frisco, head to the back patio of Bonnie Ruth’s. Grab a table, sit in the shade, and soak in the ambiance. I may be next to you having a pan au chocolat and champagne, using the free WiFi. The atmosphere takes you to the other side of the world and the staff understands that you’re going to settle in and that you don’t need attention. Grab a table and relax. Pros: Outdoor seating, quiet setting, ambiance, and WiFi. Cons: Lack of comfortable seating outside. The Community Grill is new to the scene in Frisco and is quite a hidden gem. With the WiFi password right on the wall, large booths with cozy seating, really good food, and great service, they’ll soon be a routine stop in your restaurant study rotation. It’s a great spot to meet someone for lunch or a drink as well. Pros: Large tables to spread out, comfortable booths, and my personal favorite item on the menu…Wisconsin cheese curds. Cons: They aren’t open until 11:00 am and the music is hard to ignore if you’re looking for peace and quiet. On the upside, it’s the kind of music that takes you back to your youth and makes you want to hum along. 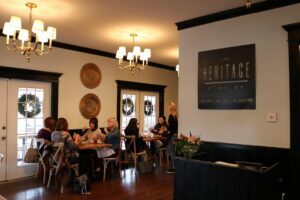 While the Rail District Frisco is just getting ramped up, the Heritage Table has already begun to make waves with their carefully created menu with made-from-scratch menu items, great patio, and welcoming environment. What you may not know is that they have free WiFi and they don’t mind you commandeering a table and pulling open your laptop. I prefer to sit on the patio to watch the cars go by and usually end up wandering over to Sunny Paige when I need a break. This is worth a try if you’re looking for a new place to make a few phone calls and fire up the laptop for a few hours. Pros: WiFi, incredible menu, indoor and outdoor seating, 100-year-old historic house-turned-restaurant, quiet at various hours of the day. Cons: Their hours can throw a newbie off (closed on Mondays). If you’re new to Frisco and haven’t taken the time to wander the different floors of the Frisco Public Library you’re missing out. You’ll find me enjoying the peaceful atmosphere of the 4th floor, sitting at a wooden desk in a comfy chair drinking a Big Red and gazing out the window. The grand wooden ceiling, cozy corners, and the general camaraderie of studying in a quiet space is incomparable. Pros: Squishy chairs, WiFi, wireless printing, completely quiet setting, lots of power outlets. Cons: No food, but there are drink machines on the first floor that you can bring up with you. I know I said this list would be about places to work remotely OTHER THAN coffee shops… But this one is too good not to mention. With indoor and outdoor seating options, free WiFi, and amazing food and beverage in addition to coffee options, it’s cozy, quiet and easily accessible from the Tollway/Eldorado. If you start there in the morning with their delicious coffee and then find the hours passing by quickly, they’ll have a sandwich or salad ready for you to recharge. Cons: It’s a coffee shop. Been there, done that. I stumbled upon Mariposa years ago and have never looked back. Hidden on the 3rd floor of Neiman Marcus at the Shops at Willow Bend mall, it’s sort of a mecca of ladies who lunch. Once I was handed a popover with decadent strawberry butter and told to “take my time” I knew I had found my study sanctuary. There’s soft music playing in the background so talking on a conference call probably isn’t a great fit, but the attentive staff with attention to detail brings me back again and again. Why would I study in an uncomfortable setting when I can sink into a booth and be pampered during an online final exam? This is living. Pros: Popovers, strawberry butter, fast WiFi and impeccable service. Nobody gives me a weird look if I ask for yet another popover. Cons: In Plano, limited hours (only open 11:00 am – 3:00 M-S and Sunday from 12:00 – 3:00 pm), lack of power outlets. I knew I was asking for trouble when I decided to study at a wine bar. I was distracted by the social time that everyone around me was having, but it was a welcome distraction from my self-imposed stress. The staff is always happy to help me find a table next to a power outlet and they don’t mind letting me hang for a long length of time while I munch on their delicious grub. When the weather permits, I highly recommend that you grab a picnic table in the back! Pros: Outdoor and indoor seating, WiFi, and the fun ambiance of a renovated, historic home with no shortage of charm, good food and wine. Cons: Everyone around you is having more fun than you are… And there’s often live music, which is fun, but possibly a distraction if you need to focus. I wandered into the Omni at The Star in Frisco looking for some A/C and was quickly swept away by the varied comfortable seating, free WiFi, and waitstaff. I told them I was there to study and they quickly ushered me to a great spot with lots of space to spread out and settle in. Everyone was friendly and encouraged me to stay as long as I needed. The upscale, peaceful atmosphere was just what I yearned for, and might be exactly the right fit for you, too. If you need a distraction, watch kids play on the Plaza football field as tourist take photos. It’s a great place to people watch! UP Inspired Kitchen is my unofficial go-to when I want to meet a friend for a weekday brunch, have a quick business meeting, or to sit down and study. While those around me are ordering one of their many delicious nutritious meals, I always opt for a dense, fatty muffin and some self-serve coffee! You’ll find me outside at a large table on a cozy cushion with my computer plugged into an outlet (surrounded by my muffin crumbs). The staff is very friendly and you don’t need to explain that you’re going to be there awhile – they just get it. Settle in, relax, and get serious work done. Pros: Welcoming staff, bottomless coffee, indoor and outdoor seating, a variety of seating types, power outlets, quiet, WiFi, delicious, healthy food. Cons: Only a couple of power outlets outside, closes at 3:00 pm. Where is your favorite place to find a bit of solitude, workspace, and good food and beverage? Leave us a comment below! The Texas Legends, official NBA G-League affiliate of the Dallas Mavericks, have become leaders in cultivating a season ticket fan base who specializes in mixing business with pleasure. Case in point, the Texas Legends Owner’s Club. Bring your business card and get ready to socialize with hundreds of executives, small business owners, and local businesses that want to connect with each other, all while getting into the spirit of supporting the Texas Legends on the basketball court. What started as a networking breakfast six years ago in the Owner’s lounge inside Dr. Pepper Arena has grown into a business “family” that meets regularly for networking breakfasts and lunch meetings with relevant business content from speakers and sponsors. Additionally, they meet for fun family events inside and outside of the basketball arena. This group is more than just a networking club. It’s a year-round entertainment package that includes networking for members to build their business and bring their family and friends to Texas Legends games and events. The Owner’s Club group brings together people with common interests to do business together and it works. Six figure deals have developed from this group. “Free agents” looking for career opportunities have been hired from this group, and not to mention the impactful charitable contributions and donations that come from this group of doers. The way I see it the Legends have created a place for family-safe entertainment, they contribute to the community and they allow average business people to network successfully. I can’t express how much Donnie, Malcolm, Spud and the organization do for this community. Corporate involvement from a spectrum of industries, from technology to health care, help to provide quality content and programs. Pizza Hut, Raytheon, Toyota, United Healthcare, IKEA, and Baylor Scott & White are just a handful of examples of Legends’ networking partners. Frisco’s Economic Development Corporation, Frisco Independent School District and the Frisco Education Foundation also are represented as speakers across the breakfast and lunch series. This group is a path to hear from these dynamic entities, learn about their initiatives and have the opportunity to get involved with them directly. I can truthfully say it is a relationship and not just a connection, which is a huge difference. The business networking opportunities bring together a growing number of people and businesses from our area which allows for further connections and relationships. The Legends also support very worthwhile causes I like to be close to and associated with that benefit children and our veterans. 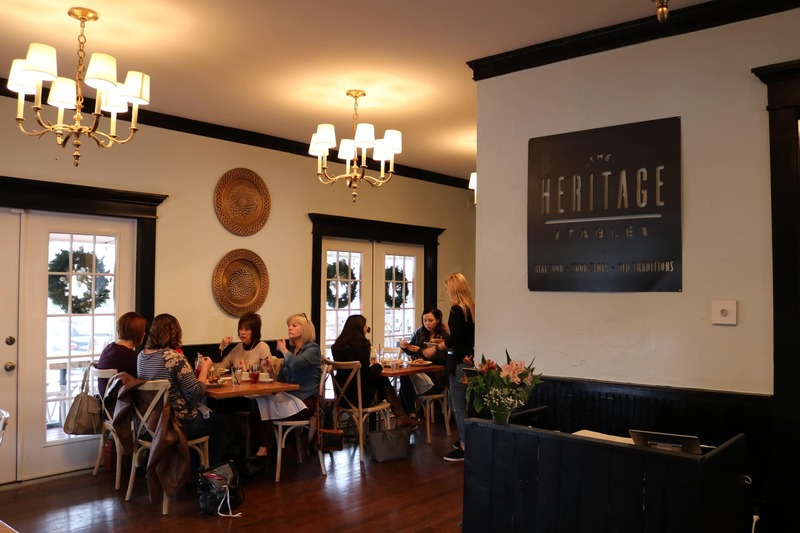 The Texas Legends facilitate the meeting of the minds, bringing people together several times a month over coffee, lunch, happy hour and family events. The group might meet to catch a movie, tour the facilities or even go bowling with the Texas Legends players and front office staff. We are a basketball team but that’s not all we are or all we do. We are a platform into the community. We don’t want to be in the community – we want to be part of it. If all we are doing is the sporting event, we aren’t doing enough. The Legends Owner’s Club unique form of networking is working. For the seventh straight year, the Legends set new highs in attendance, season tickets sales and renewals, as well as involvement by corporate partners. The upcoming draft kicks off the Texas Legends’ ninth season in Frisco, and they continue to raise the bar both on and off the court. To be a part of the Texas Legends family call 214-469-0822 or visit their website. The arrival of August brings with it a Dive-In movie at the Frisco Water Park and a play at Theatre Frisco! The Frisco Young Professionals host two social gatherings this week and Frisco Fine Art invites you to enjoy Wine, Bites, and Friends! All of this and more… This Week in Frisco! For WHAT TO DO, WHERE TO GO, and WHO TO KNOW in Frisco, you must subscribe via email… You don’t want to miss our articles, videos, podcasts, and updates! Momma Meet UP – PJs and Pancakes: 8:00 am – 11:00 am at UP Inspired Kitchen. Their playhouse on the patio is a beautiful place for moms to MEET UP and share quality time with each other and their littles. Frisco Young Professionals – Connections and Cocktails: 5:30 pm – 8:00 pm at Dave & Buster’s Frisco. Mix and mingle with fellow young professionals, ages 21-40. Bring your game-face and plenty of business cards! Heavy appetizers and a Power Game Card will be provided for all registered attendees. Drinks are available at a Cash Bar. Registration for this event IS required. A Walk in the Park: Interpretive Nature Guided Tour: 9:00 am – 10:30 am. Join Frisco Parks and Rec for a walk out in the wild Northwest Community Park, home of the Dallas Off-Road Bike Association’s mountain bike and BMX trails. Wine-Up Wednesday at Silver Fox Steakhouse: 5:00 pm – 7:00 pm at Silver Fox in Frisco. Sample 5 wines from the region of Burgundy, France. RSVP required: call 214-618-5220. Frisco Young Professionals presents Focus on Frisco: 11:30 am – 1:00 pm. Special guest speaker, Tammy Meinershagen, Executive Director of Frisco Arts. HeartStories GNO: 6:30 pm – 9:30 pm at Crest Infiniti. Gather your girlfriends for a night of laughter, fun, and freedom! This month’s theme: Phonetography – Capturing Beautiful Memories With the Camera in Your Pocket. Register with the code LIFESTYLEFRISCO. Theatre Frisco: Man of La Mancha: August 3-19 at Frisco Discovery Center. The original 1965 Broadway production based on Cervantes’ epic 17th-century novel, Don Quixote, is a remarkable, poignant, moving musical that was one of the first shows to musicalize a piece of historical literature. Wine, Bites & Friends: 6:30 pm – 8:30 pm at Frisco Fine Art in The Rail District. Happy times start here! Start your weekend at the gallery for sips, bites, great art and new friends. Summer Cooking with Chef Tre Wilcox: 6:30 pm – 8:30 pm. You’re invited to an exclusive culinary event at the Lincoln Experience Center at The Star. Top Chef contestant, Tre Wilcox, will be joining us on Center Stage. Together, we’ll taste and discover his freshest summer recipes with a live, in-person cooking demonstration. Plus, enjoy a curated wine selection and a variety of tasty light bites. Dive-In Movie at the Friso Athletic Center: Gates open at 8:00 pm. Float in the pool and lazy river while you watch a movie under the stars at the Frisco Water Park. Friday night family fun can’t get better than this! Featuring Coco. Frisco RoughRiders: 7:05 pm at Dr Pepper Ballpark. Frisco RoughRiders vs Corpus Christi Hooks. Bonus: 15th Anniversary Celebration and post-game fireworks. Frisco Rotary Farmer’s Market: 8:00am-Noon every Saturday from April 21, 2018 through October 27, 2018 for farm fresh produce, meats, eggs, baked goods, preserves, handcrafted items and more. Dallas Rattlers: 7:00 pm at The Ford Center at The Star. The Dallas Rattlers vs Florida Launch. FC Dallas: 7:00 pm at Toyota Stadium. FC Dallas vs San Jose Earthquakes. Yoga in the Gardens: 8:30 am – 9:30 am at Shades of Green. Unroll your mat underneath our 250 year old Cottonwood trees and soak in nature as you soothe your soul. Bring your yoga mat! Frisco RoughRiders: 7:05 pm at Dr Pepper Ballpark. Frisco RoughRiders vs Corpus Christi Hooks. Bonus: 15th Anniversary Celebration Weekend and post-game fireworks. Monat – Get their most popular products at up to 70% off this month! Take the hair quiz and ask Lisa how! Legacy Locators – Let Legacy Locators find you the perfect apartment… If your search results in a lease, you’ll receive a $100 gift card OR 2 hours of free moving! SkinBasix – We’ve MOVED! Come see us in our new location, just across 121 from Frisco! Get $20 OFF my Basix Facial! Vitality Bowls – Our July “Bowl of the Month” is… The LIBERTY Bowl! The Liberty Bowl is Acai blended with Almond Milk, Strawberries, Banana and Raspberries. It’s topped with Organic Hemp/Flax Seed Granola, Blueberries, Strawberries, Coconut Shavings and Honey. Sweets On A Stick – Get 10% off any Custom Order of two dozen or more! Freshii – 25% off Breakfast Burrito and Bowls, July 23-July 29. Frisco Fine Art – SUMMER ART BLITZ – 15% off entire collection of art, glass, and sculpture. 20% off all local artists. BEYOND Studios – In JULY, it’s our “Friends with Benefits” promo in-studio! Go BEYOND with your BESTIES all month! First class free for new clients when you bring a friend to class. Email FriscoInfo@theBEYONDstudios.com to book your free first class for both you and a friend! Coffee with the Mayor: August 10, 8:00 am – 9:00 am, George A. Purefoy Municipal Center, 6101 Frisco Square Blvd, Frisco, TX 75034. McCallum Room, 4th Floor. A monthly opportunity for coffee and conversation with Frisco Mayor Jeff Cheney. Roll with the Council: August 11, 1:00 pm – 3:00 pm. Join Mayor Jeff Cheney and members of the Frisco City Council for ‘Roll with the Council’, an on-street bike ride at a conversation pace. First Day of School in Frisco ISD: August 16, Students return for the first day of the 2018-19 school year. Camp Gladiator: Stadium Takeover: August 18, 5:00 pm. Camp Gladiator will host a once-in-a-decade, free stadium dash at Ford Center. Owning your own business is a dream for many. But without proper planning and sound advice, the dream becomes a nightmare for many. Many of the mistakes that lead to business failure are avoidable. But impatience, laziness, misguided assumptions, inexperience, and personality-business misalignment can all contribute to bad decision making and a failed business. Whether your a 1st-time business owner or have been around the block, it’s always good to practice sound fundamentals when buying a business. To help anyone thinking about buying a business in Frisco, we sat down with Tiffany Swartz of Transworld Business Advisors to find out what some of the most common mistakes are when buying a business and how to avoid them. Mistake #5: Assuming that just because it’s a franchise it’s safe. The franchise model is appealing because part of the business comes built in. Marketing, processes, branding, experience and more are often a part of the package. But Tiffany warns that not all franchises are created equal and knowing how to navigate the differences can be overwhelming. Just because a franchise has brand recognition doesn’t mean it’s the right fit for you or the market you’re seeking to serve. Variables such as your personality, goals, finances, and experience will all come into play when deciding if a franchise it the right decision for you and if so, which one is the best fit. Sadly, we’re not always the best judge when it comes to ourselves so working with a business broker who deals with franchises is your safest bet to find a good fit. Mistake #4: Buying a startup as an absentee owner. If you’re planning to buy a startup then plan to roll up your sleeves. The idea of buying and operating business and earning income from it without working in the business on day-to-day basis sounds appealing but it’s rarely the reality with startups. It’s also important to recognize that a lot of start-ups run loose in the beginning which can make placing a proper value on that business difficult. It’s might also mean hidden hazards. If the start up game sounds exciting to you and you find one for sale that’s a fit, be sure to work with someone who will perform thorough due diligence and prepare to get your hands dirty. Mistake #3: Not having the proper financing in place. There are a lot of ways to finance a business. Some are very traditional while others are mind-boggling in their creativity. There is no “official” way to finance a business but it’s advisable to have the details of how you will finance your business sorted out before you get too far. It’s also important to have a clear picture of what you can afford. Back of the napkin calculations won’t do it and there are a lot of small things that add up when buying a business. Even if you understand the numbers well it’s advisable to have a 3rd party advisor there to make sure you don’t get yourself into something that comes back to bite you later. The finance side of buying a business is a area that trips up professionals and first-time business owners so do your homework and get help. A business advisor can help you make sense out of the financing options available to you. Mistake #2: Getting into a bad lease. Having an office or storefront of your own can be exciting, but Tiffany has seen many business struggle or go under because they got into a bad lease. Bad leases are something that, in dealing with local businesses through Lifestyle Frisco, we have watched take down many beloved locations in Frisco. Leasing business space is a different animal from the apartment leases and home loans many business owners have experience with. This is one area you definitely don’t want to navigate by yourself. Mistake #1: Not engaging a 3rd party business advisor or broker. This one might seem self serving but a good business broker will do a lot to ensure you get into the right business for you (yes, the good ones take your personality and lifestyle into consideration). They’ll also give you the best chance at success long term by getting off to a good start. If the best athletes, business minds, and top-performing professionals have coaches, there is no reason you should buy a business without one. By working with someone, you’ll take the emotional factor out of the equation and help your business get off to a great start. The process will be less stressful and you’re less likely to wind up in a business you hate instead of love. We LOVE seeing new businesses open in Frisco. If you decide to take the plunge we’re here to see you succeed. If you have questions about buying a business or franchise give Tiffany a call and make sure your business ownership dreams have a chance to become reality. There’s SO much confusion out there about organics and I’m always asked, “Is it worth it?” Buying organic not only means that your food is free of pesticides and other chemicals, but it’s also better for the environment and supports small, sustainable farmers. But let’s be real… Organic also means expensive, and we don’t want to spend our whole paycheck in the produce section. Strawberries, and tomatoes are sprayed with chemicals to keep insects from eating them, and these chemicals soak into the soft skin saturating the fruit with lots of chemicals. Apples also absorb chemicals through their thin skin, and some are sprayed with Diphenylamine, which is actually so toxic that it was actually banned in Europe. And, with regard to apples, don’t forget to buy organic for apple juice and applesauce, too. Spinach has spongy, porous leaves that, unfortunately, are excellent at soaking up pesticides, making buying organic a total no-brainer here. Even the humble, hearty potato doesn’t seem like something that would scream out for organic options. But it might be the most important. One study found that conventional potatoes had more pesticides than any other crop in the produce section. So, what SHOULD You Buy Organic? Avocados might be hard to peel, but that thick outer skin also protects you from harmful chemicals. Recent research on broccoli samples showed that more than 70% were totally pesticide-free. Asparagus also tends not to carry much chemical residue, making it safe to skip out on organic. Onions are another veggie that there’s not a huge need to buy organic. Because they have layers that you peel, you’re never consuming the outer layer, where the chemical residue lurks. Pesticides also are rarely used on kiwis (and plus, you don’t eat the skin anyway), so they’re a totally safe bet for going non-organic. So break out of your food rut and Go Organic with this quick and easy reference guide to use the next time you go shopping! In a world of ever-evolving health and wellness trends and topics, it can be hard to identify which products actually make an impact when it comes to looking and feeling our best. It’s easy to feel overwhelmed by the endless stream of advertisements promising to sell a cure-all or “miracle product” that will transform our health overnight. If you’ve been keeping up with the latest and greatest in natural health care, you’ve probably heard the term “probiotic” quite a bit over the last few years. With so many probiotic products on the market, it can be tough to identify supplements that are safe and effective. Whether you love probiotics or you’ve never tried one before, Dr. Raj of RenueRX Pharmacy is here to share the truth behind this natural health solution. Plain and simple, probiotics are live bacteria. While some people may instinctually cringe at that word, our bodies actually need a significant amount of “good bacteria” for healthy digestion and a strong immune system. Although our bodies naturally produce this bacteria, external sources including diet, exercise and antibiotic use can significantly deplete our supply. Low levels of good bacteria can lead to health problems, GI upset, and a weakened immune system. Many people turn to probiotic foods and health supplements to aid digestion, maintain a healthier gut and combat a number of gastrointestinal problems. We find probiotic bacteria in a number of foods like yogurt, cheese, and even pickles! Dietary modifications can help balance out the bacteria in your digestive tract and improve your overall digestive health. However, you shouldn’t simply reach for the first yogurt cup you see in the supermarket. Many popular dairy products are pasteurized before they reach the store. The pasteurization process kills a majority of the live bacteria in foods like yogurt, and the few active cultures that remain are often killed by our stomach acid before the body can absorb them. If you’re looking for probiotics that really pack a punch, natural supplements are a great way to meet your body’s needs without scouring the aisles for a specific brand of yogurt. Supplements are also ideal solutions for those with dietary restrictions or chronic gastrointestinal illnesses such as IBD or IBS. There are several supplements that offer probiotics, but not all are created equal. Probiotics each differ in the strands of bacteria present and their ability to survive in the acidic stomach environment. With hundreds of probiotic strands in existence, it’s important to consult with a pharmacist or physician before you implement a supplement into your diet. Unfortunately, the wellness market is full of supplements that advertise far beyond their chemical makeup. Some products promise a complete transformation basically overnight, while others make general claims of ‘dietary health’ without revealing what you can actually find in each capsule. The pharmacists at RenueRX want you to feel confident about the supplements you use every day. Many of their patients turn to ReBiotic for healthy digestion and good bacteria. This natural probiotic supports general wellness, boosts immunity and combats many forms of GI distress. Classified as a broad-spectrum probiotic, ReBiotic contains six strands of healthy bacteria, each representing a type that’s naturally found in the gut. While the majority of probiotics offer 1-10 billion colony forming units (CFUs), ReBiotic is designed to deliver 20 billion CFUs. Unique acid-resistant capsules also ensure that your body will absorb the bacteria it needs to function properly. RenueRX Pharmacy also offers a range of natural supplements that are specially formulated to keep your body functioning at its best. To learn more, schedule your consultation with a pharmacist today and discover the unique supplement solution that’s right for you.